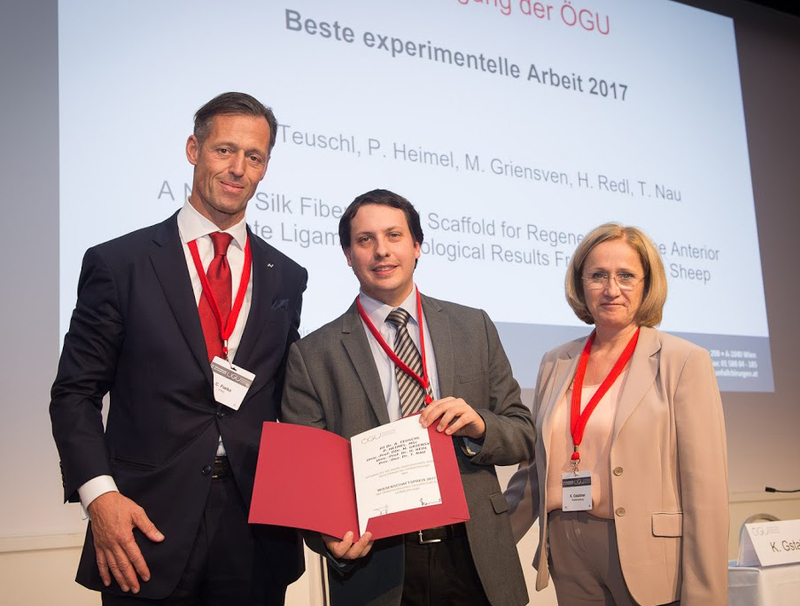 The Austrian Society for Trauma Surgery (Österreichische Gesellschaft für Unfallchirurgie, ÖGU) awarded the 2017 Science Award in the category Best Experimental Work in the Field of Trauma Surgery to Andreas Teuschl as first author of the study “A Novel Silk Fiber-Based Scaffold for Regeneration of the Anterior Cruciate Ligament: Histological Results From a Study in Sheep”, published in the American Journal of Sports Medicine (2016 Jun;44(6):1547-57). Together with his team he successfully established the use of a silk scaffold for anterior crucial ligament regeneration. Currently, Andreas Teuschl is the Head of the City of Vienna Competence Team Tissue Engineering SignalTissue (MA23#18-08) and accompanies the start-up company Morphomed GmbH by the translation of the silk ligament scaffold to its future clinical use. In course of the ÖGU award he presented the study at the Society’s 53rd Annual Meeting, which took place on October 5th to 8th 2017 in Salzburg, Austria. An abstract of the study findings is published in the JATROS Journal for Trauma Surgery.